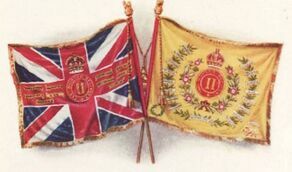 Re-designation of 55th (Westmorland) Regiment of Foot, 1 July 1881. 2nd Border Regiment postings from formation to the First World War. France and Flanders (7 Division) from September 1914. The 2nd Battalion World War One casualty list has been compiled using the publication Soldiers Died in the Great War 1914-19, Volume 39, The Border Regiment and cross-referenced with the Commonwealth War Graves Commission database. The number of casualties compiled to date does not necessarily reflect the total number of casualties for this battalion due to the possibility of missed names and the (current) exclusion of officers and other ranks that were attached to the Border Regiment. This listing is a work-in-progress. For the 2nd Battalion roll of honour, see 2nd Battalion Border Regiment Casualty List. This page was last edited on 23 March 2017, at 18:06.